I was talking to a friend in Big Santa Anita Canyon, Glen Owens of Monrovia, who told me tomorrow’s (Saturday) Mount Wilson Trail Race will not be held. He said it is the first time since the race began in 1908 it had been cancelled. He and John W. Robinson, author of the best selling hiking book “Trails of the Angeles” were going to cut the racing ribbon at the start line. I hear they may run it next weekend but I’m still not sure. Owens was joking that the Santa Anita Fire in late April denuded some of the slopes adjacent to the trail, which leads from Sierra Madre to Mount Wilson. What is normally a treacherous drop becomes even more so, he said, because there is little brush to break your fall. I’ve hiked it and have run it to Orchard Camp several years ago and remember thinking how one slip could send you down the canyon several hundred feet. And that was during good conditions. So, I think the organizers made the correct call. I was hoping to drive up Chantry Flat Road and check out the new store Saturday, but Owens tells me that the canyon got 2.5 inches of rain from the recent storm, causing a minor slide on Chantry Flat Road that makes it unpassable. That’s disappointing. I hope they can fix it this weekend, when I’d like to get some hiking in bertween raindrops. Speaking of rain, the storm may have moved mud, but it also may have a silver lining. It may be just the right conditions to germinate seedlings in the soil, Owens said. 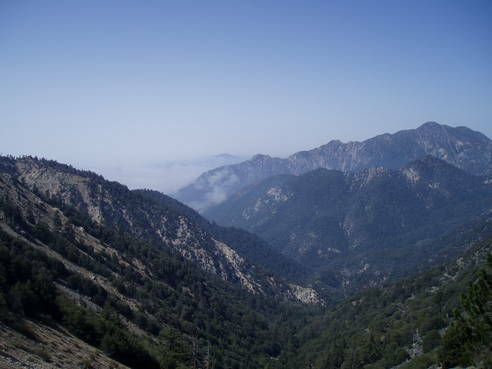 It would be a good beginning to new life in the fire-damaged Angeles above Sierra Madre. 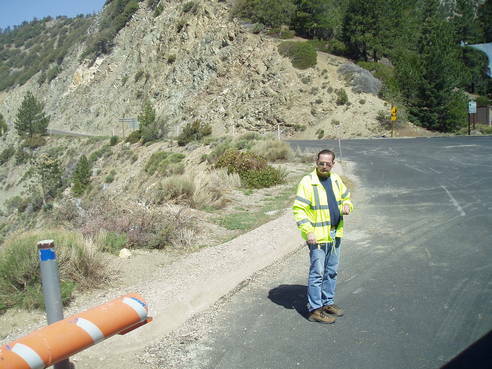 Thanks to the Azusa Chamber of Commerce, I got to drive the length of Highway 39 to the junction with Highway 2, also known as Angeles Crest Highway. 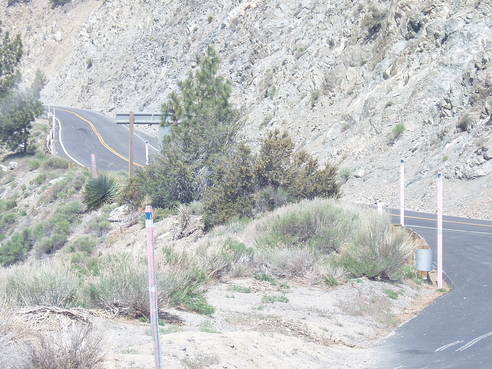 The last 6 miles or so of this state highway have been closed (hence the signs in Azusa and in La Canada that say “close to Wrightwood”) since 1978. That’s right, 30 years. They are lobbying Caltrans to get that portion of the road fixed and reopened, so folks can make the loop from Azusa to Mount Waterman, Mountain High ski areas, Wrightwood and then down to La Canada and the 210 and back to the east San Gabriel Valley. So would getting the road fixed that leads from the West Fork to Coldbrook Campground and Crystal Lake picnic area and campground. That’s 350+ camp sites that just sit there unused! 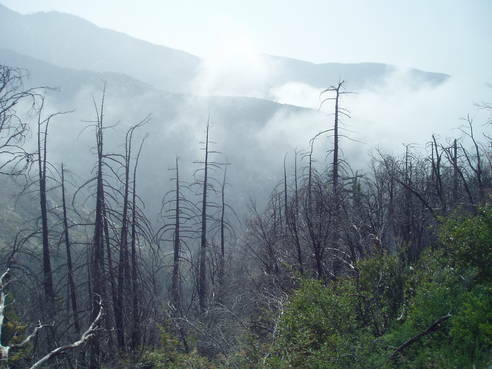 Above: Morning fog hangs amid the charred pine trees where the Curve and Bridge fires damaged the forest in 2002. Above: Bill Larson, the Caltrans chief for Highway 39, opens the gate above Bear Canyon and Deer Flats, allowing our bus to go through to Highway 2. Above: Highway 2 (Angeles Crest Highway) from the top left, meets Highway 39. The connection from 2 to 39 has been closed to the public for 30 years.